Paralympian wheelchair basketball star Richard Nortje treated fans to a points scoring feast of quality shooting, as he inspired his team-mates to a 71-56 victory, in Green vs Gold Series action at the Mandeville Sports Complex, Bezuidenhout Valley, Johannesburg at the weekend. Of the Gold team’s final score, Nortje scored 38 points. With South African senior men’s wheelchair Bbasketball team head coach Franck Belen sending equal strength line-ups on to the court, in order to take a step closer to finalising his Sasol Amawheelaboys team to face New Zealand in the Sasol All Star Series from 28 August to 5 September at the same venue, the match was fiercely competitive, played at a fast pace. 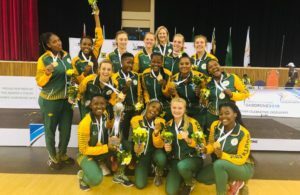 For their efforts, the Gold team collected R6000 to be shared among the players, with a further R6000 going towards providing assistance to beneficiaries in the form of the Netcare Rehabilitation Service to Persons with Disabilities and the Hope School for physically disabled children in Parktown, Johannesburg. The campaign was put in place by Sasol and Wheelchair Basketball SA in order to further inspire the players to strive for excellence on court and to make a difference to society. 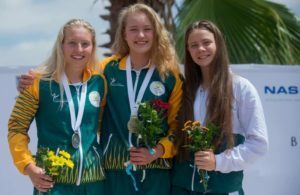 ‘The spirit among the Sasol Amawheelaboys players is absolutely superb and the challenging for places in the 12-person national team to compete in the Sasol All Star Series against New Zealand and at the International Wheelchair Basketball Federation African Qualifiers in Algiers, Algeria in October, is another positive sign,’ said Nortje afterwards. 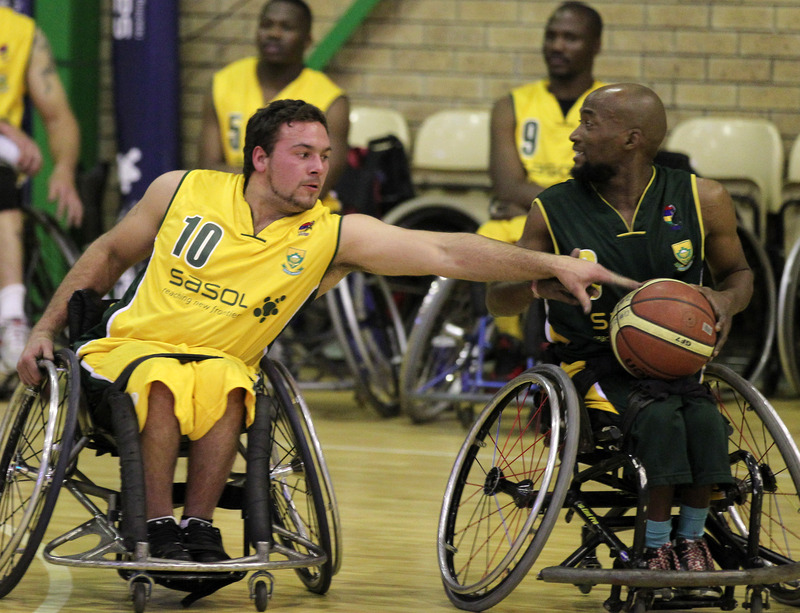 The Sasol Amawheelaboys players will get a further chance to strive for on-court excellence and to raise funds for the beneficiaries when the final two Green vs Gold Series matches take place at Mandeville on 12 September and 25 October this year. In the picture Kyle Louw(gold) and Gift Mooketsi (green) are in the thick of the action.